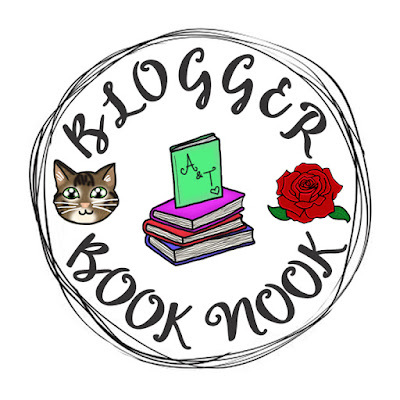 I'm sure Abbey would agree with me when I say that we can't believe how well Blogger Book Nook has been taken. The Facebook group is overflowing with new members and is so interactive and friendly. I feel very proud to say I was apart of forming this book club and again, I'm sure Abbey would say the same. 1. Young adult books sometimes have the reputation of being a bit cliche - What do you think about this? Does it spoil your enjoyment of a book if you can predict the ending? I must admit that I can see why some people may think this, however when I pick up a YA book I rarely can predict the ending, most of the time the ending surprises me with an ending I never saw coming! However, if I am unfortunate to pick up a YA book that does have a predictable ending I wouldn't say it ruins the enjoyment of the book but the ending just becomes a little flat due to having a sure idea of how it was going to end, which is a shame. I have seen 'The Fault in Our Stars' as well as read it and I'm really not a fan of either (which I know is a very unpopular opinion), I just really don't enjoy the story! Nor did I enjoy 'Everything, Everything'. I have no interest in seeing the film as again I just didn't enjoy the book much at all! (Again, another unpopular opinion). However, I did enjoy '13 Reasons Why'! I loved the Netflix series, I binged it in about 3-4 days! 3. Where does YA rank in your order of favourite book genres? Is it a genre you'd usually read for? As stated before, I am a BIG fan of YA. So, I would definitely rank YA as my top favourite genre, as there's so many sub-genres within the genre too! I'm especially a big fan of fantasy YA books. Oh man, this is such a hard question to answer for me as I love so many characters from so many YA books. I adore Cress from The Lunar Chronicles, she's so sweet and brave; she's just a great character to read about! I also love many other characters as well though, I could write a complete post on the characters I love in YA. Damn, why did Abbey choose four FAB YA series!? I love all of these for so many different reasons. I love The Hunger Games as this is the book series that got me hooked on reading again. I love Harry Potter because well, it's Harry Potter!? I love The Lunar Chronicles as it's so unique and different, I adore the characters and it's such a fun series to read. I love The Mortal Instruments because it's so dark and mysterious yet also magical. I also feel so attached to the characters and I'm only up to book 4 in the series. This month I decided to pick up a new series for this theme as it's a series I have been eyeing up for a while and heard many great reviews about it. The book I've picked up and half way through reading is The Young Elites by Marie Lu. It's set in a mythical world where a deadly illness hits, killing off thousands or leaving individuals with unworthy marks in them (such as scars) causing them to be frowned upon. However, there're a few individuals that not only are left with scars/disfigures but also powerful gifts. So far, I'm really enjoying this read, it started off with a bang and hasn't stopped producing great content. All the characters are also awesome and I can;t wait to see them evolve and see where the story takes them! I definitely have high hopes for this book and I can't wait to share my final thoughts on the book with you on my Reading Round Up post, coming soon!! That's a wrap on another Blogger Book Nook post! I really enjoyed writing this months post, purely because it was all on about my favourite book genre! 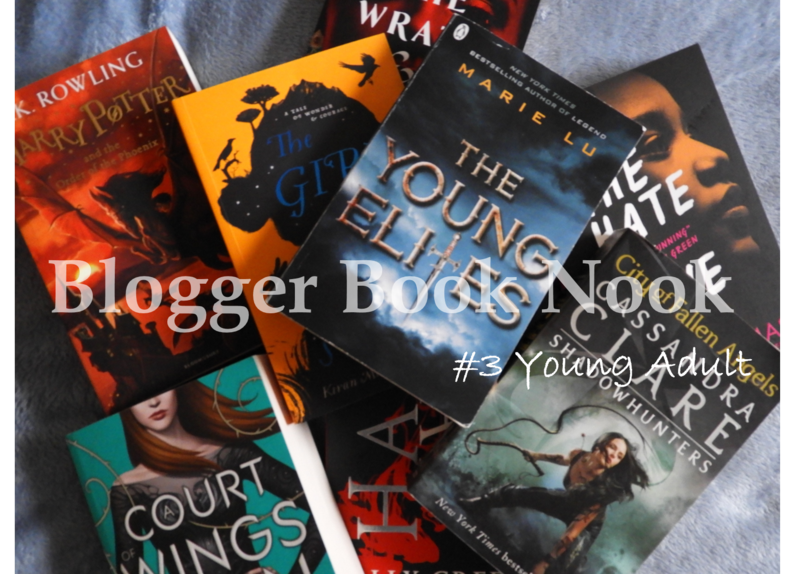 I also thought it was a nice idea to share with you some of my favourite YA books and recommend them to you, I definitely think this is something I'll in future Blogger Book Nook posts (if I have recommendations that is!). Don't forget you're more than welcome to join in and answer these questions yourself. Abbey and I love reading your posts and seeing you all get involved! Also, don't forget to join our Facebook group if you haven't done already! If you 're also a big book lover and are a fan of Goodreads, then please follow my profile on there! I try and update my profile as much as I can! Have you read any YA books this month? Do you love YA as much as I do? If so, what are your favourite YA books? I absolutely love YA. It's what I read and review most often. That's the same as me, YA is my go-to genre! A girl after my own heart - I am a huge fan of YA. I feel like it gets a bit of a bad rep for being a bit cheesy and predictable but I don't think it is. It's funny because whilst reading this post I realised how much I prefer stand alone books to series and I read more of them. I do read the occasional series, like harry potter and the hunger games but I personally find them harder because you have to be invested in them and keep up with them. I once read a series and I loved it but then where I thought it had ended it actually had three more books but I didnt realise this until a few years later and was a bit sad because I probably wouldn't have gotten back into them. However, I do want to read the mortal instruments and possibly the lunar chronicals.